One of the easiest ways to find drafts in your home is by lighting a stick of incense and observing the wisps of smoke to see if it is blown or pulled in one direction or not. Drafts enter through doors or windows that are not shutting with a good seal. If your door or windows rattle when they are closed, then outside cold air is entering. Both doors and windows should have weather stripping applied on both sides and across the top so that when the door closes, it has a good seal. Most newer EnergyStar rated entry doors use weather stripping that magnetically sticks to the metal door. Meanwhile, worn-out foam weatherstripping usually crumbles or falls off. If you need to replace weather stripping, use a foam type that will compress and expand as needed, to give a good seal. Most are seal adhesive and will work with any kind of door, including wooden ones. While new energy efficient windows are sealed inside their frames, many older windows are held in place with glazing. Over time, glazing can crack and break. The window panes become loose in the frame, and not only do they let in outside air, they are more likely to break. Glazing needs to be done right to preserve the window’s look and you want the angles to be neat and clean. The weather is also important to keep in mind, because glazing takes a while to dry and cure. Also, be sure the glass and the frame are clean and dry before caulking. If you’d rather wait until spring, then a safe and reliable temporary fix is to use silicon caulk. Scrape out the old, loose glazing and lay down one or two beads to hold in the glass. Remember to clean out any dust, debris, and old paint lumps from sash window tracks or casement seals because these can keep the windows from closing properly. Cleaning out rain gutters, before winter sets in can help avoid many serious problems. Blocked, over-flowing rain gutters can spill water down the exterior of your home, allowing water to penetrate paneling. In older homes, this can trap moisture and begin rotting the wall framing leading to expensive repairs. 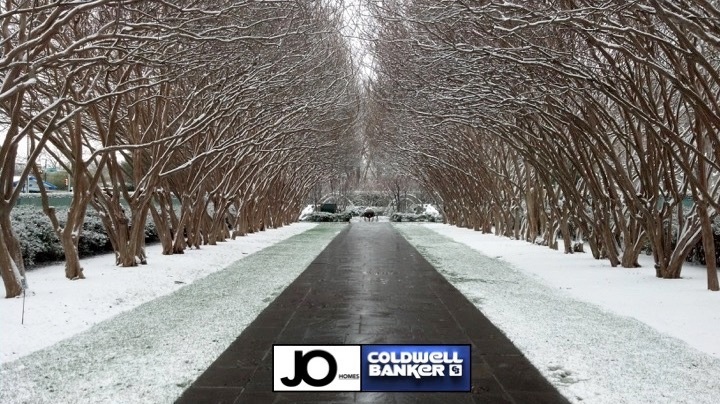 Especially here in Texas, cloged rain gutters can freeze, cause ice dams, and over-flow. The cumulative ice weight can tear rain gutters completely from the side of the house. In some cases, clogged gutters may contribute to ice dam problems that seriously damage roofs. You'll typically pay $70 to $225 to clean gutters on a single-story house, depending on its size. Also look for missing or damaged gutters and fascia boards and repair them. For about $80 to $100, a technician will inspect your furnace or heat pump to be sure the system is clean and in good repair, and that it can achieve its manufacturer-rated efficiency. The inspection also measures carbon-monoxide leakage. If you act soon, you'll minimize the chance of being 200th in line for repairs on the coldest day of the year. If your ceiling fan has a reverse switch, use it to run the fan's blades in a clockwise direction after you turn on your heat. Energy Star says the fan will produce an updraft and push down into the room heated air from the ceiling (remember, hot air rises). This is especially helpful in rooms with high ceilings - and it might even allow you to turn down your thermostat by a degree or two for greater energy savings. Look for damaged, loose or missing shingles that may leak during winter’s storms or from melting snow. If need be, hire a handyman to repair a few shingles, starting around $100. Check and repair breaks in the flashing seals around vent stacks and chimneys, too. Make sure that no water will puddle near the base of your home. Add extensions to downspouts where needed, so that water runs at least 3 to 4 feet away from the foundation. Mow your leaves instead of raking them, say studies at the University of Michigan and Purdue. The trick is to cut the leaves, while dry, into dime-sized pieces that will fall among the grass blades, where they will decompose and nourish your lawn over the winter. Use your lawn mower without its bag, and optionally swap the cutting blade for a mulching blade (about $15 to $25). The process may take several passes. Make sure your fireplace, chimney and vents are clean and in good repair, before lighting the first log. That will prevent chimney fires and prevent carbon monoxide from creeping into your home. You can expect to pay $50-$100 for an inspection, then $100-$300 for the cleaning, however some contractors may deduct the inspection price from the cleaning when purchased together. Make sure that you are prepared for town to shut down. Think about everything you, your family, and your pets need to get through a 72 hour period without power. Some necessary items are batteries for the flashlight, and food and water for everyone including the pets. Once the ice comes then try your best to stay at home. Now days there are so many people from so many different places, and most of these people have no experience driving on ice, so even if you are good be careful around anyone else.